I have been making NPCs, monsters and scenarios inspired by Pu Songling's Strange Tales from a Chinese Studio. For each entry I take two or more stories from the Penguin Edition translated by John Minford and make gameable material. I highly recommend checking out this book as it is a quick resource for any GM in need of inspiration. Most of the entries are short and to the point. Today I am doing Painted Skin (#34), The Merchant's Son (#35), and A Passion for Snakes (#36). You can see my previous entry HERE. I have been looking forward to gaming the story Painted Skin. I already did so to a degree in Wandering Heroes of Ogre Gate, but there I drew from the story and the movies it inspired. The Painted Death monster that is an homage to Painted Skin is quite different from the creature in the Pu Songling story. This entry will be a purer form of the creature presented in Painted Skin. Of all the stories in the book, this is the one people should most make a point of reading because it has been made into several movies and is a magnificent horror story in its own right. There are significant differences between the story and the films as well. 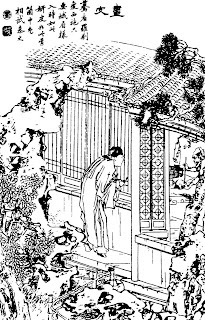 The tale is about a man named Wang who meets a beautiful woman claiming to be a concubine of a wealthy man. She is on the run because a jealous wife in the household was abusive towards her. Wang takes her into his home and begins sleeping with her. One day a Taoist Priest sees him walking in the street and says he has an evil aura around him. Wang ignores the warning, but soon glimpses the woman pulling off her own flesh and and touching it up like a painting. Her true form is a ghoulish demon and she wraps the skin around her body to once again look like a young beauty. Wang seeks out the taoist priest who gives him an enchanted fly whisk. Wang then stays in his wife's bed and avoids seeing the young woman. Initially the fly whisk deters the creature. However she bursts into the room and tears out Wang's heart before running away. The taoist priest tracks her down destroys her, and places her smoky spirit into a gourd. The wife is despondent and pleads with him to resurrect her husband. The story continues with her efforts to have him brought back to life. 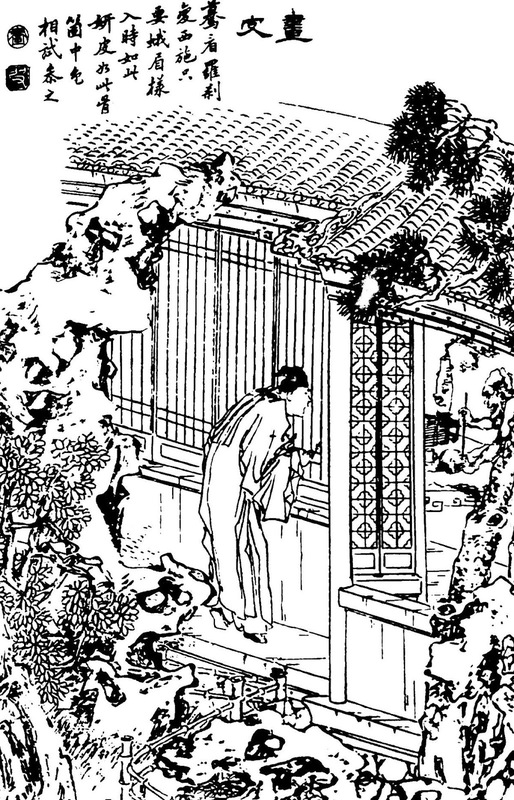 The Merchant's Son is about a young boy whose mother becomes enchanted by a Fox Spirit that lives in a neighboring manor. The fox keeps sneaking into her chamber, making love to her, and leaving her in a maddened and obsessed state. The husband, a merchant, is a way for much of the story. The son, who is quite young, decides to take on the fox demon by himself. At first he merely cuts off its tail, but after an extended investigation into the creature (where he discovers it is one of three living nearby), he poisons some wine, pretends to be a fox spirit himself by donning a fake tail, and gives the wine to the foxes which kills them. The fox spirits in this one are all male and I modeled the Captivating Fox Demons below on them. I took a lot of liberties though. Something about this story reminds me of the portion of Dracula where Lucy suffers anaemia from the vampire's feeding. The mother in the story seems to be in a similar predicament, and so I tried to come at it from that angle. Both Painted Skin and The Merchant's Son are longer than many of the other tales in the book, but the next one is very short, barely a page. A Passion for Snakes is about a man who loves to eat snakes and uncontrollably devours them on sight. I decided to make a ritual in the style of Black Magic or Boxer's Omen that could explain this behavior. With this Ritual you cause a person to suffer a terrible Mental Affliction where they feel compelled to devour snakes anytime they see them. To perform the ritual you will need a piece of the person's hair and a sample of either their skin, blood or fingernails. With these you make a simple dish of rice porridge which the target must consume. Make a Ritual TN 6 Roll and Talent (Cooking) TN 6 roll to create the porridge. On a Success if the target eats the porridge, they become afflicted with a hunger for snakes for 1 year. On a Total Success on either roll, the effect lasts 10 years. On a Total Success on both rolls, the effect is permanent. Anyone who suffers this malady strongly desires to eat snakes. Anytime they see them, roll 2d10 against Resolve. On a Success the person cannot help themselves but to grab the creature and stuff it in their mouth for consumption immediately. Not only does this carry the obvious risk of being bitten by the snakes but eating them exposes the target to the venom (roll its Potency Rating against Hardiness according to the Poison rules on page 97 of the WHOG rulebook). Painted Maidens look like beautiful women and often claim to be concubines, courtesans or performers. However they are in truth a type of demon, not unlike a Raksha or Yaksha. Their true form is that of a hideous creature with green flesh, blade-like teeth and claws. They assume their form by painting skinned corpses to create an outer appearance of beauty that they can wear like a costume. The skin is nearly perfect, making them look like a normal human to most eyes. They feed on human hearts and desire to become a real person more than anything else. Though they usually prefer to take beautiful forms, Painted Maidens can take any appearance they wish to design and sometimes present themselves as old women, or even men. Painted Skin: Painted Maidens can fabricate flesh and facial features for themselves using the Talent (Painting) skill on an existing piece of flesh. To do this they must skin a human body for raw materials (they can use several different bodies to create the ideal form). They then wear the fake skin to appear like a normal human. They are so good at painting their bodies and faces that few can tell the difference. It takes two consecutive successful Detect rolls to notice any flaws in the disguise, and characters must specifically be examining the creature closely. Immunities: Painted Maidens are only harmed by energy attacks and cold. They are also affected by Rituals and can be contained like demons. Smoke Form: If they are physically destroyed, Painted Maidens turn into a heavy black smoke and then reform in 1d10 days. However they can be imprisoned into a gourd vessel or similar object using Binding Demon Ritual (and similar powers). Claw and Heart Taking Hand: Painted Maidens have long sharp claws that can dig easily into human flesh. Make a Claw Roll against Parry. On a Success they do 5d10 Damage with their claw ability. On a Total Success they do 5d10 Damage plus 5 Extra wounds and successfully pull out the target's heart if the damage is enough to kill them. Captivating Fox Demons usually come in groups of 2-5, and all are often siblings. They look like foxes in their normal form, but can take human shape longer and longer the more they feed off human life essence. In their human form they appear attractive and charming but always retain their fox tail. Their victims often become their followers as they impart a sense of longing and desire in anyone they feed upon. Therefore they often travel as wandering scholars or masters, with a retinue of captivated disciples. Drain Qi: Captivating Fox Demons can drain the Qi of targets by inhaling their life essence. On a Successful Arm Strike or Grapple Attack, instead of doing Damage, Fox Demons can choose to drain Qi equal to the Damage they would have inflicted. Those without Qi are instead drained of Hardiness. Both return at a rate of 1 per day. Every point drained extends the Fox Demon's life by 10 years, increases its Max Wounds by 1, and makes it able to stay in Human Form 1 ten minutes longer per day (see Human Form below). Anyone drained is captivated by the Fox Demon as well (see Captivation). Human Form: Captivating Fox Demons can assume human form for 1 hour per day + 10 minutes per Max Wound. So a Captivating Fox Demon with 6 Max Wounds, can take human form for 2 hours. In this form it appears fully human except it has a bushy fox tail. Captivation: Anyone who gives the Captivating Fox Demon their life breath or Qi feels a deep connection to the creature and a longing for its presence. Make a 3d10 Roll against the Target's Wits every day after they have been fed upon by the Fox Demon. On a Success the target does not feel at ease unless in the presence of the Captivating Fox Spirit. When the Captivating Fox Spirit is absent the target suffers a -1d10 Penalty to all Mental Skills and becomes restless, even angry. Vanish: These kinds of Fox Demons can vanish in a blink, even passing through wall. As a Skill action, they can make a Speed roll TN 7. If they succeed they effectively teleport anywhere within 80 feet. Track: Foxes can use their Detect Skill to track scent. *There is a passing reference to finding a substitute in the original story, and it seems to be more about finding a fresh corpse. However, the recent Painted Skin films elaborate on this in a nice way by allowing the demon to trade skins with a willing person. I think this is more interesting and more gameable so I am including it (especially since I did not in my original monster entry for Ogre Gate).